Whatever you do, try to resist the urge to plan too much! 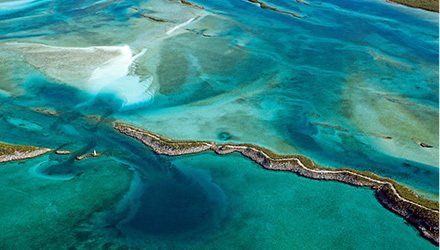 Aboard a crewed yacht charter in the Caribbean, spontaneity and freedom are the epitome delights to savor. If you’re an early riser, enjoy a cup of java on deck, watching pelicans dive for their breakfast. Join them on a wake-up plunge overboard or challenge your beloved to an invigorating swim to the beach. Perhaps your captain lured you on a sunrise fishing expedition or, gingerly rocked by the gentle waves, you enjoy a blissful lie-in, knowing well that a sumptuous gourmet breakfast will be waiting for you when you rise aboard your crewed yacht charter in the Caribbean. Aboard crewed yacht charters in the Caribbean, your next port of call may be an hour or two away... it could be a pinnacle rock jutting skyward and surrounded by coral reef, a powder white beach fringed with palms, or a secluded bay that’s a siren’s call for watersports. Underway, you can sunbathe, dive into that bestseller that’s been on your bedside table for months, revel in the exhilaration of slicing through the waves, learn to sail, or simply spend quality time with your loved ones. Meals aboard a private crewed yacht charter in the Caribbean are always events to be celebrated and, for many guests, end up as one of the major highlights of their trip. Chillax with your family and friends in the shade of the cockpit awning, as you feast on a fresh lunch of locally caught seafood, artfully grilled to perfection. If you’re sailing the Adriatic, you may enjoy a Caprese salad of ripe cherry tomatoes and fresh mozzarella drizzled with basil-infused olive oil. Or the eastern Mediterranean? Let your chef wow your taste buds with a mouth-watering salad of calamari, olives and fresh oregano. 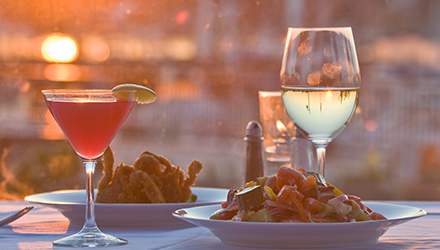 Taste your way through the high seas as you explore the culinary highlights of your chosen destination. Vino in hand you can indulge in one of life’s ultimate pleasures: a long and leisurely lunch with your loved ones, in one of the most spectacular corners on earth. As famous Chinese writer Lin Yutang once famously said: “'If you can spend a perfectly useless afternoon in a perfectly useless manner...you have learnt how to live’. 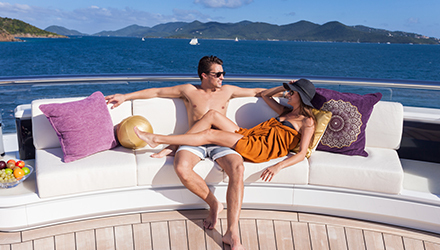 Afternoons aboard private crewed yacht charters in the Caribbean are anything but useless, although no one would blame you for wanting to perfect the art of dolce far niente – or the sweet doing of nothing. If the mood strikes you, then go ahead and take a relaxing siesta in your cabin, or a spot of sunbathing on top deck. Feeling revitalized and energized? Then try your hand at waterskiing, tubing, diving, snorkeling and even fishing. Who knows...you may even catch your dinner. Jump on shore for some hiking or shopping and allow your crew to recommend activities and sightseeing you may enjoy. Move on or stay put? As always…the choice is yours. 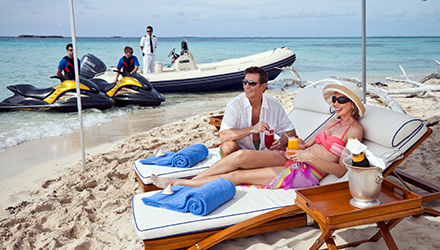 On an Ocean Getaways’ crewed yacht charter in the Caribbean, you are anchored in a calm bay every night. Share a delicious cocktail and canapés as the sun’s last rays kiss the horizon, and delight in the wafting aromas of your gourmet dinner being prepared. After an active day under the sun and in the surf, your appetite is on overdrive. 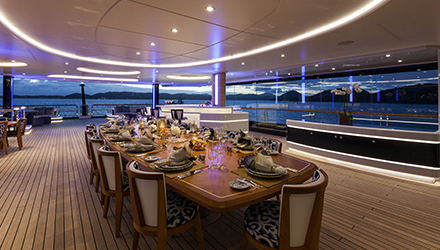 Dinners aboard crewed yacht charters in the Caribbean are served with much fanfare, usually under the stars. After dinner, follow the rhythmic lure of the steel drums ashore, dance barefoot on the foredeck, learn about the stars, play a hand of poker, linger over a cognac with your yacht-mates, go on a moonlight snorkel…and rediscover the romantic pleasure of life.